Lespedeza leptostachya is a Midwestern endemic, known to occur at scattered locations in Illinois, Iowa, Wisconsin, and Minnesota. The majority of plants occur in and near the Des Moines River valley of southwestern Minnesota and the nearby lakes region of northwestern Iowa. The species was perhaps uncommon even before European settlement, but has become extremely rare because of the widespread conversion of its native prairie habitat to agricultural uses. The majority of surviving populations are in remnant prairies on steep slopes or in other isolated prairie habitats where cultivation is not feasible. Lespedeza leptostachya was originally listed as a state endangered species in 1984, but was later reclassified as state threatened in 1996. It was designated a federally threatened species in 1987. Lespedeza leptostachya is one of two members of the genus Lespedeza that are native to Minnesota. It has trifoliate leaves that are approximately 2-4 cm (0.8-1.8 in.) long and 3-7 mm (0.1-0.3 in.) wide. Leaves change from bright yellow-green in early summer to gray-green in late summer. Flowering plants are generally between 23 and 46 cm (9 and 18 in.) tall and have light pink flowers loosely arranged in an open spike. Individual pods are 1.5 mm (0.6 in.) in diameter. Individual plants may have 1-5 such flowering spikes on each stem. There is usually only 1 flowering stem arising from each root crown, but under some situations there may be up to 4 or 5. In contrast, the more common L. capitata (round-headed bush clover) has slightly larger and whiter flowers, dense round fruiting heads, and leaflets about 4.5 cm (1.8 in.) long and 1.8 cm (0.7 in.) broad. Hybrids between L. leptostachya and L. capitata are fairly common when the two species occur in close proximity. Hybrids can be distinguished by having longer, looser heads than L. capitata, and thicker stems and larger, broader leaves than L. leptostachya. Lespedeza leptostachya populations in southwestern Minnesota typically occur on north, northeast, or northwest facing mesic to dry-mesic prairie slopes. Plants are often localized in slightly concave, midslope areas. Soils at these sites are typically coarse textured loam or colluvium with high sand or gravel content. Populations in the southeastern part of the state occur on the upper slopes of bluff prairies and are usually smaller and more isolated. This species may have also occurred on level, deep soil prairies before the time of settlement, but those habitats are now essentially gone. They have been either plowed and planted to row crops or severely degraded by years of livestock grazing. The majority of Minnesota populations of L. leptostachya occur in prairies that have been or are presently used as pasture. Populations may have as few as ten plants or as many as thousands. Lespedeza leptostachya produces both self-pollinating and potentially cross-pollinating flowers on the same plants, but it appears that the majority of seeds produced are from self-pollinated flowers. The limiting stage of its life cycle appears to be seedling establishment. Seedlings are less likely to survive than other small plants, and much less likely to grow substantially within any given year. Plants take several years to develop from seedlings to flowering stage. Individual mature plants may produce hundreds of seedpods in a year. However, actual seed viability may be low. Once established, L. leptostachya is a long-lived perennial. Individual plants are known to live for over 20 years, and they are suspected to live much longer. They can withstand defoliation by native herbivores such as mammals and insects for up to three consecutive years, but beyond that mortality will likely ensue. The best time to search for L. leptostachya is when plants are in fruit, from mid-August through mid-September. Flowering plants can be seen from mid-July through early August and the species can be recognized anytime after early June. Seedlings can be recognized in the field until early August by the presence of the two round cotyledon leaves or a single round protoleaf below the trifoliate stem leaves. Lespedeza leptostachya is rare because of the loss and degradation of its prairie habitat. Therefore, most conservation and management considerations should be directed toward maintaining surviving prairie remnants that harbor this species. More specifically, it is essential to maintain or reinstitute the natural processes upon which this species and its associated pollinators and mychorrhizal symbionts depend. Because these habitats are now only fragments that are isolated from the natural forces that created and maintained them, they will almost always require active management. This may include initiating a regimen of prescribed burns, brush clearing, and erosion control. Timing of these activities is critically important, especially fire. All prescribed burns should be conducted in early spring before the plants appear above ground. This is vitally important because seedlings are very vulnerable to fire. The impacts of livestock grazing and cutting wild hay on native prairies containing L. leptostachya require further study. Use of broadleaf herbicides should be avoided. A number of habitats that harbor large and healthy populations of L. leptostachya have been purchased by public agencies and private conservation organizations. This has resulted in a core of protected habitats that may ensure the survival of this species. However, several large, key populations remain in the stewardship of private landowners who maintain the areas as pastures. Several long-term monitoring projects are underway to help understand certain life history and population parameters. The greatest remaining challenge is to implement the management techniques that have been learned from this research. Clewell, A. F. 1966. Native North American species of Lespedeza (Leguminosae). Rhodora 68(775):359-405. Cole, C. 1989. Isozyme and mitochondrial DNA variation in Lespedeza capitata and L. leptostachya (Fabaceae). Dissertation, University of Minnesota, Saint Paul, Minnesota. 122 pp. Menges, E. S. and P. F. Quintana-Ascencio. 2002. Population biology of the threatened Prairie Bush Clover (Lespedeza leptostachya Engelm.) (Fabaceae). Unpublished Population Viability Assessment for Prairie Bush Clover. Archbold Research Station, Lake Placid, Florida. Smith, W. R. 1987. Studies of the population biology of Prairie Bush-Clover (Lespedeza leptostachya). Pages 359-366 in T. S. Elias, editor. Conservation and management of rare and endangered plants. Proceedings of a Conference of the California Native Plant Society. The California Native Plant Society, 5-8 November 1986, Sacramento, California. United States Fish and Wildlife Service. 1988. 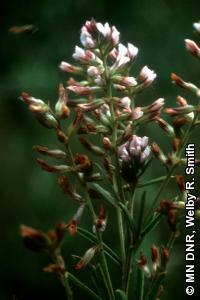 Recovery Plan for Prairie Bush Clover (Lespedeza leptostachya). United States Fish and Wildlife Service, Fort Snelling, Minnesota. 41 pp.